The Spaniard said he thinks Sky was not willing to deal with the "wear and tear" of holding onto the race lead so soon. FLORENCE, Italy (VN) — Team Sky wanted to lose the lead in the Vuelta a España, say rivals in the peloton after five days of racing. On Wednesday, the super team let the escape group ride free to Roquetas de Mar and, in doing so, let Frenchman Rudy Molard (Groupama-FDJ) take the jersey from its rider Michal Kwiatkowski. The Spanish heat and mountain passes need to be considered, however. 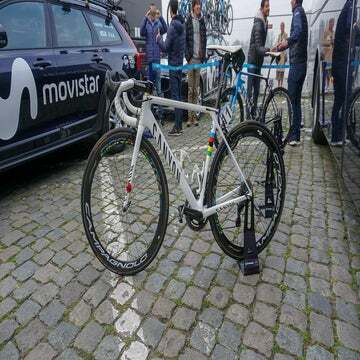 “Sky wanted to lose the lead,” said Spanish star Alejandro Valverde (Movistar). Valverde won his home tour in 2009 by beating Samuel Sánchez and Cadel Evans. In this edition, he is considering chasing for the overall but he’s mostly racing for teammate Nairo Quintana and preparing for the world championships road race two weeks after the Vuelta ends. Valverde knows that the Caminito del Rey and Alfacar uphill finishes, although tough, were simply appetizers compared to the main courses coming in weeks two and three. Team Sky knows this too. The Vuelta a España has toyed with different colors for its leader’s jersey since it began. In recent years, it presented yellow and golden tops to the race leaders. Now it is a dark red. Kwiatkowski wore the red jersey since stage 2, when Valverde won the stage. He took the lead thanks to his gains in the stage 1 time trial and finishing second to Valverde in stage 2. Three days at the top, though, was enough for him and the team. He has the opportunity of a lifetime to lead the biggest team in a grand tour. Since Chris Froome rode four grand tours in a row and Geraint Thomas won the Tour de France last month, the team allowed its top stars to have a break. They will race the Tour of Britain later in September. For years, Kwiatkowski dominated one-day classics and week-long stage races. His palmarès includes the 2014 road world title, Milano-Sanremo, Tirreno-Adriatico, and from earlier this month, the Tour of Poland. Team Sky, since signing Kwiatkowski in 2016, relied on him in grand tours to help its stars. He developed into a better climber through that role. The team is now giving him his space to race for the Vuelta overall and protecting him with riders normally reserved for Froome, like David De La Cruz and Sergio Henao. However, team boss Dave Brailsford’s roster also includes younger riders Tao Geoghegan Hart and Pavel Sivakov, both in their first grand tour. The “wear and tear” that Valverde mentioned will especially affect Geoghegan Hart and Sivakov, the latter who won the Baby Giro and Valle d’Aosta in 2017, when they reach the second and third week. The 15 men who stayed free in stage 5 gained between two and four minutes when the stage finished in Roquetas de Mar. Molard, 28 and already a stage winner in Paris-Nice this year, was the best-placed rider overall and gained enough time to take the lead. Eliminate Molard, though, and you have a similar GC picture that you had only 24 hours earlier with Kwiatkowski on top. That could stay the same through the first rest day on Monday. Team Sky, which has had countless leader’s jerseys, gave itself a rest and Molard something special. It also made friends in the cutthroat peloton. Next week, Molard returns to work for team leader Thibaut Pinot but he will not forget Sky’s gesture.